FlatUIKit was originally written by Jack Flintermann in March of 2013, before iOS7 had even come out. The idea was to give a nice flat look to some of the native iOS components. Then iOS7 came along and introduced a decent API to do most of these tasks. However, for backwards compatability, we will be attempting to maintain iOS6 compatability, as long as feasabilty possible. If we find a reason to move to iOS7 only support, we will leave a branch for remaining iOS6 support, and move forward. FlatUIKit is a collection of iOS components styled with the “Flat UI” aesthetic that we created while building Grouper for iPhone. Its design inspiration comes from Flat UI and Kyle Miller. Styling is implemented via categories on/drop-in replacements for existing UIKit components, so integrating it into your project is very straightforward. to your Podfile. If you don’t use Cocoapods you’re welcome to use git submodules, or simply download it and include it in your project manually. Note that FlatUIKit requires the CoreText framework as well as iOS > 6.0. FUIButton is a drop-in subclass of UIButton that exposes the additional properties buttonColor, shadowColor, cornerRadius, and shadowHeight. Note that if you set any of these, you have to set all of them. FUITextField is a drop-in subclass of UITextField that exposes the additional properties edgeInsets, textFieldColor, borderColor, borderWidth and cornerRadius. Note that if you set any of these, you have to set all of them. FUISegmentedControl is a drop-in subclass of UISegmentedControl that exposes the additional properties selectedColor, deselectedColor, selectedFont, deselectedFont, selectedFontColor, deselectedFontColor, dividerColor and cornerRadius. Note that if you set any of these, it is recommended that you set all of them. FUISwitch is not a subclass of UISwitch (UISwitch is too inflexible to subclass), but rather a reimplementation that exposes all of the methods of UISwitch. In addition, it also provides access to its underlying on/off UILabels and other subviews. Similar to FUISwitch, FUIAlertView is a reimplemenation of UIAlertView that exposes all of UIAlertView’s methods (and delegate methods, with the FUIAlertViewDelegate protocol), but with far greater flexibility in UI customization. All of its child UILabels, UIViews, and FUIButtons can be customized at will. FUIAlertView *alertView = [[FUIAlertView alloc] initWithTitle:@"Hello"
message:@"This is an alert view"
You can modify the backgroundColor and selectedBackgroundColor of a UITableViewCell without losing the rounded corners. 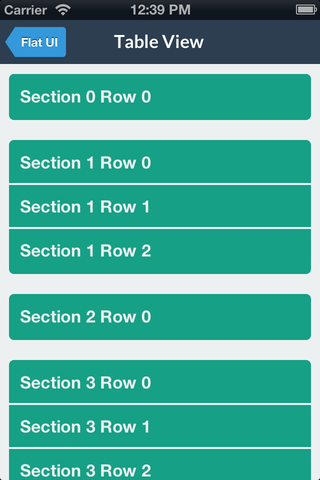 The cell will copy the UITableView’s separator color. The separator height is exposed as separatorHeight and the radius as cornerRadius. Like some other flat components, we simply provide a category to automatically configure a popover appearance for iPad by only having to set a background color. You can now use the great icons provided by FlatUIKit in your app. The easiest way is to use a label, but I will be adding support to use them in buttons, ImageViews, and other conveniences. Contributions are totally welcome. We’ll review all pull requests and if you send us a good one/are interested we’re happy to give you push access to the repo.